With over 120 years of combined legal experience, the professionals at Flippin Collins & Hill are ready to provide you with the options to resolve your legal issues. General Areas of Practice - general trial practice, real estate law, business law, wills and more Personal Injury - medical malpractice, wrongful death, auto accidents, nursing home negligence Family Law - child support, divorce proceedings, family law, adoption and more We offer free personal injury consultation where we can answer all your questions. 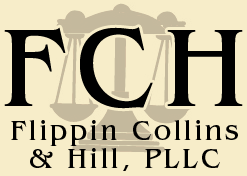 The attorneys at Flippin Collins & Hill located in Milan, TN specialize in personal injury cases. Our professionals have over 120 years of combined experience handling medical malpractice, nursing home negligence and auto accident cases. Our Personal Injury Services Include: -Medical malpractice -18 wheeler accidents -Auto / truck accidents -Slip and fall accidents -Workers' compensation -Social security disability -Nursing home negligence -Personal injury / wrongful death Our Firm Has Over 60 Years Of Experience Serving Milan And Jackson, TN. Gibson County Bar Association (Secretary/Treasurer).